Having driven up the east coast in a rush, passing by several whisky distilleries by the time we got to the west coast I was quite keen to have a look round one on a tour. However actually getting to one proved harder than we thought what with turning up after the last tour had left at Talisker and no production running at Ben Nevis. When we came to doing Oban we booked in advance and organised it all properly. Read my top tips for visiting a whisky distillery here. Oban is a cute and adorable harbour town which grew in the 1700’s from a few farmers cottages slowly in to what it is today. The distillery was founded in the 1700’s in the heart of the town and has been there ever since. 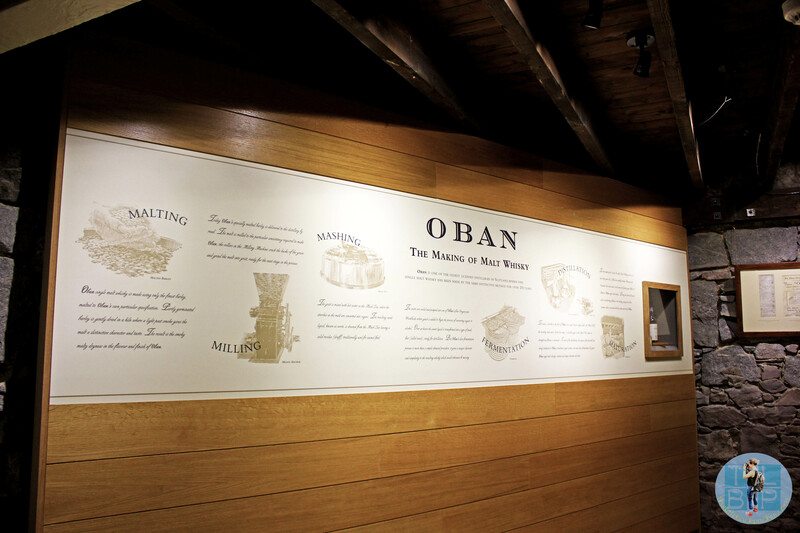 Oban is a distillery with so much history and a huge demand for product yet the distillery is tiny! Our tour started on the hour and consisted of 12 people, mostly older couples – I was defiantly the youngest there! We got taken around in order of how the whisky is actually made so first stop was the malting – this is the process with the barley and peat – something which is done off site as the distillery is so small they don’t have space for a fire room. Once this process is complete it is delivered to the distillery and the workers can start the process. The mixture is grinded down to a powdery mix which has to be 10% flour to work for the Oban 14 whisky. The water is then added to this powdery mix which is called ‘mashing’. This process is done in a huge wooden tank before being transferred over to one of the four wash tanks. Here the mixture is left to ferment for four days; we got to see two wash tanks in the process one at two and one at four days. The difference was very noticeable. We were then taken through to the heart of the distillery, where the stills are. Now Oban is such a small distillery that it only has two stills! The demand for the product really requires much more so the men that work here are on shift Sunday evening till Friday evening – they work in shift patterns 24 hours around the clock! Unfortunately we visited on a Saturday so there wasn’t actually anything going on in this room, but Mel (our guide) did a great job of talking through the process and explaining it to everyone. I genuinely found it very interesting; there are several differences at Oban compared with other distilleries because of its size like the shape of the pipes the vapour cools in outside. However everything that is done here like in any distillery is measured and re-measured to make sure everything is 100% precise. Each bottle of whisky that is produced needs to be exactly the same as the last. The methods they use here are traditional and very similar to those the men would have used back when the distillery first opened – not much has changed. 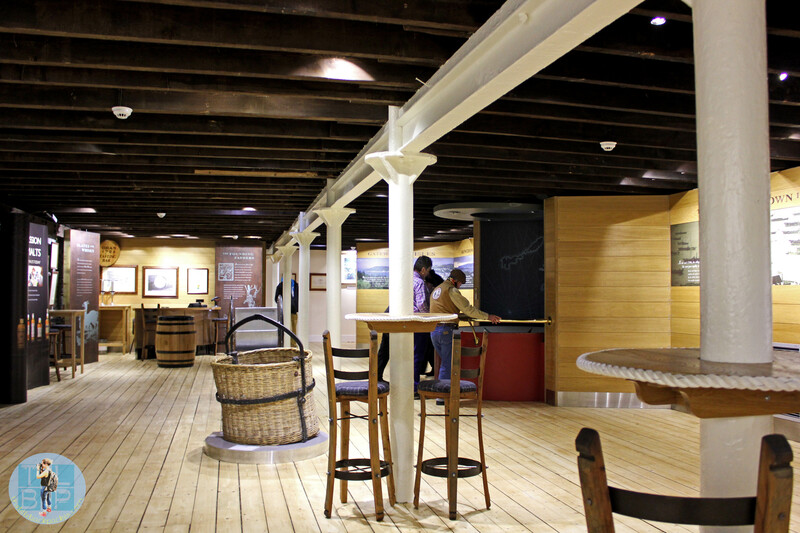 The exhibition in the shop – I have very little photos from the Distillery as you couldn’t use your camera inside. The only other part of the process that is not done on site is the storing of the casks. Could you imagine how much space that needs?! Oban store their whisky in bonded warehouses which means that they don’t pay tax on the alcohol until after the 14 years – a good job as it loses a fair percent of its volume. Mel was our tour guide and she was absolutely brilliant. You could tell she had a genuine interest in the whisky and really loved telling you about it all. She could answer pretty much everyone’s questions and always had more to say on every topic. Not only that but she told us about things that weren’t even part of the tour just because she had the knowledge. When she told us that this was her third week in the job I genuinely thought she must be joking – it seemed like she had been doing it for years she was so confident. We were an extremely lucky group as we got to taste some rare and rather strong whisky this was an Oban 10 year. The barrel had been purchased by the distillery manager to share with people on tours to give them something a little bit special to remember Oban by – we also got given a glass to keep. 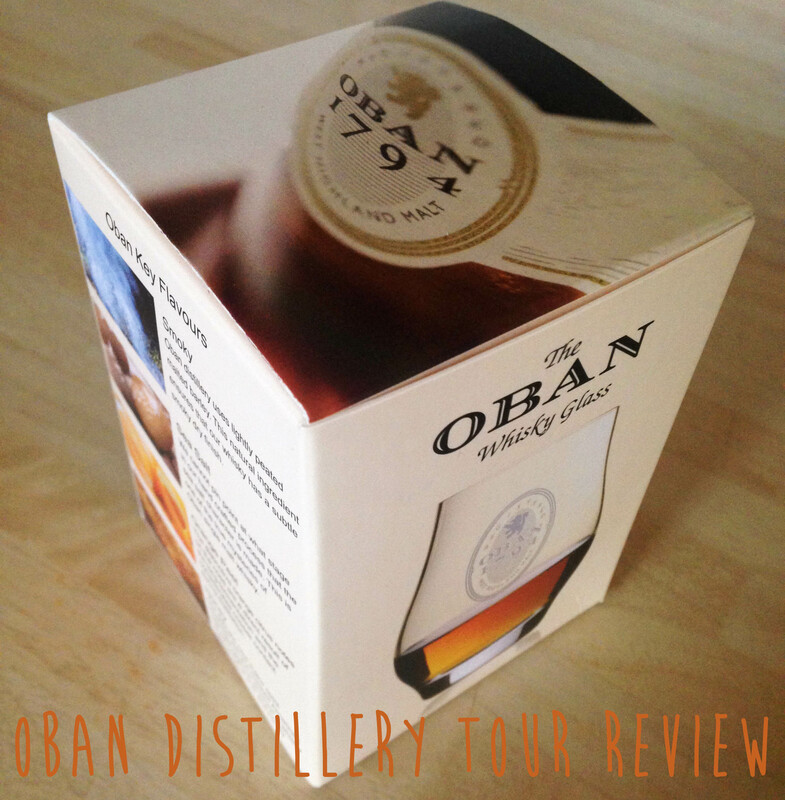 As a standard part of the tour we also tasted the Oban 14 year. Next Post How Much Does A Week In Greece Cost?